HashBrowns…October 1-5, 2012 Get Outside! The weather has taken a drastic turn this last week. Temperatures are falling well below zero, and the mornings are frosty. It has even snowed briefly once or twice. It’s hard to be motivated to go outside to play. Really hard. To play outside means I must don a pair of socks. I am not a fan of socks. Sigh. But then I remind myself of how much happier we feel after a good romp in the woods and I put my darn socks on, gather the smalls, and head out. The first big lungful of fresh, crisp air seems to chase all the grumbles and fussiness aside. I’m happier, and the kids are happier. To borrow a phrase from the beloved Anne of Green Gables, there is so “much more scope for the imagination” outside. Curling up in a big armchair with a blanket and a book is always a treat, don’t get me wrong. I am a huge fan of reading. There are books stacked on every flat surface of my home. A book can take you places you have never been. But so can being outside. Especially for the smalls. They choose their walking stick and they are off exploring lands that only exist in their wildest dreams…not even the greatest author could recreate the magic that takes place in a child’s imagination. I know this because I remember. Outside is where I was always happiest as a child. I didn’t come inside until the street lamps went on. My hands were dirty and my nose running, and I was ALWAYS racing to the bathroom because I always waited too long! 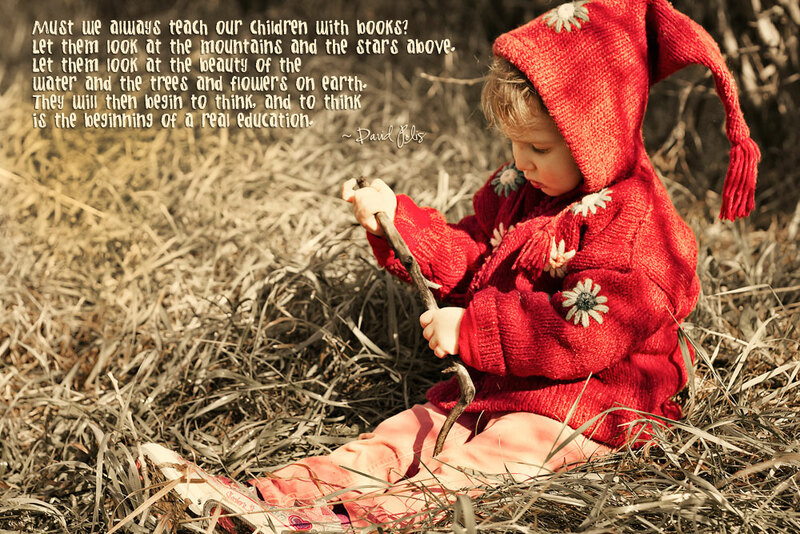 No storybook has ever come close to matching the adventures I had in my own mind as I played outside. I suppose I am making a quiet promise to myself to just do it. To brave the chill, put on my socks, get outside and give the children in my world the same opportunity that I once had as a child. An opportunity to make magic. Ah imagination! You are so absolutely right! I remember how reading was too, as a child with imagination. Anne of Green Gables, I no longer remember the story but I remember it was full of scope for the imagination. A great reminder for us all! Sometimes I too want to stay inside, but you are so right! The second we get outside, it is just so great!!! (socks & all) ha! Love outside in the autumn! Just had a look at your photography site… They’re fantastic! yes, children need to play outdoors. among its benefits are keeping the eyes sharp and exposure to necessary dirt (which lets them grow up with lesser allergies as adults). Wow! Wow! Wow! May I move in? Here I sit with myself and youngest on Columbus Day. The baby is working on #3 of Curious George and I have no inspiration to go out in the chilly fall weather…..Until I read this. Time to get up, get dressed, and take this boy of mine outside for a bit of much needed fresh air. Oooo…this is a great comment! Enjoy your playtime!